The purpose of the base was in the nineteenth century, to magnify the statue of Liberty. But its designers could not help but try a make a full-fledged work of art, that's why it is relatively impressive today. The neoclassical style is consistent with the statue itself of this style. To know how to visit the monument, clic here. To know about the museum, clic here. The history of the base is inseparable from that of the statue itself. 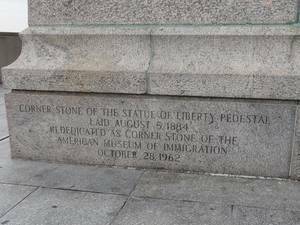 The implantation site, which was unofficially chosen by Auguste Bartholdi in 1871, when it first came to the US to build ties with the US, was not officially selected until 1877, when the statue seemed to take a real existence for members of Congress. Those are the ones who authorized him to set aside the land where the strong Bedloe's whereabouts to erect the statue there, providing at the same time its future maintenance. General WT Sherman was appointed to officially select the site and the latter, According to the will of Bartholdi chose the island Bedloe. Then General Charles P. Stone, an engineer of the Army, was appointed Chief Engineer by the American Committee. Stone was an acquaintance of Hunt, they had already had the opportunity to work together. Moreover, he began to Egyptian Khedive service in the 1860s, when Bartholdi had offered its monumental statue, the beginnings of the Statue of Liberty. Bartholdi and Stone had met on this occasion and had even worked together on the study of the future statue, finally abandoned for lack of budget. It chooses a team, on good terms with the French-American cooperation society. The names out of themselves: The architect is Morris Hunt, a well known architect on the East Coast of the United States. He was the first American to take the courses of Fine Arts in Paris, and return to Paris, he founded a school based on the same principles. It was part of the Union League Club, the cooperative partnership between the two countries, and had worked on many major projects. The main consisted in designing large homes for wealthy families of the states of Rhode Island, New Jersey, Massachusetts, where he got her best customers. But he had also worked for the US Treasury, banks, etc. 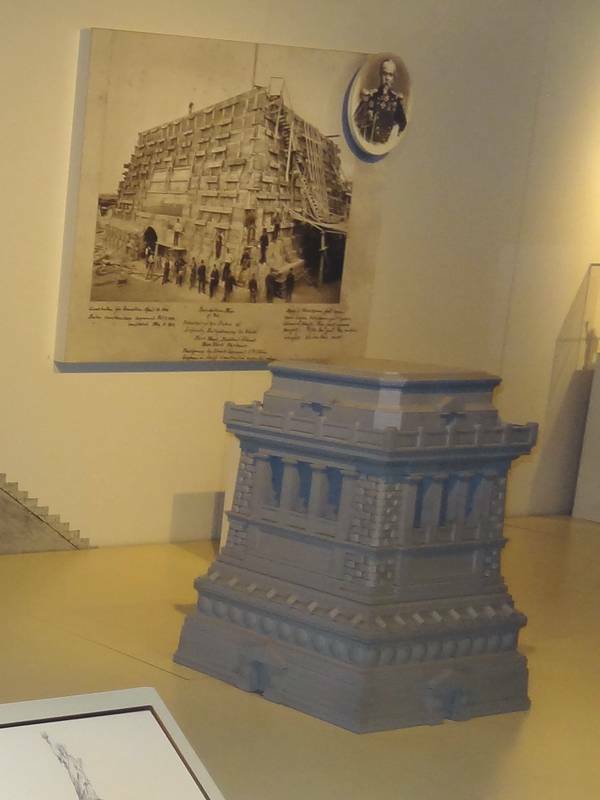 Model of the pedestal, as can be seen in the museum of the statue. Model of a proposed but not adopted pedestal to the base of the statue. 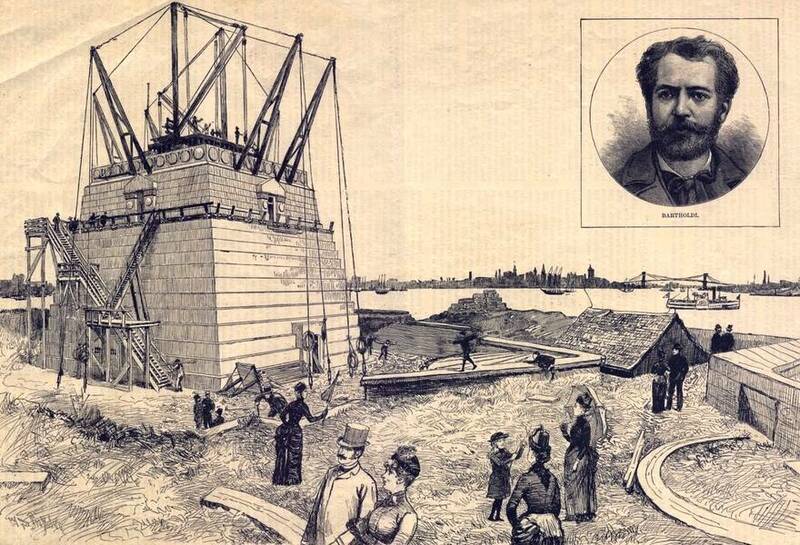 One of the first problems which faced Morris Hunt was to choose the style and size of the base of the statue of Liberty. Interested in Ancient Egypt as Bartholdi, he turned first on a antique style pedestal. Her model was the Lighthouse of Alexandria, another of the 7 Wonders of the World. Hunt designed a cylindrical base in masonry, large size, but it had to face the facts: It was not suitable as a support of the statue. He was several tries before understanding her error. To draw the lighthouse of Alexandria, he conceived as autonomous works, gold was asked a work that was magnifying the statue, not magnify yourself. Hunt Then answered one of the plans that best suited him and he reduced proportions. Become more modest, showed off its pedestal the statue: So it was he who was adopted. As an engineer, Charles P. Stone, he was faced with another problem: When he began digging the foundation he fell on heavy masonry masses of stone and concrete that were hidden under the surface of the island, and which served as shelter against tanks or bombs. These shelters were small underground vaulted rooms, very massive. But these architectural elements were not necessarily all indicated on the plans which had the chief engineer, hence the need for him to show initiative and adaptability to remove without taking delay in the construction of foundations. The construction took place between 9 October 1983 and 22 August 1886. The October 9, 1883 marked the beginning of the digging of the foundations. These were completed in early August 1884 as the first stone, symbolic, was officially put 5 August 1884, 10 months after the start of work. It happened on a rainy day, in the presence of numerous officials. This stone was sealed leaving a space, a kind of box in which we put different objects belonging to the members present at that time, but also a copy of the Declaration of Independence of the United States. It happened during a ceremony chaired by William A. Brodie, a notorious Freemason, Grand Master of the Grand Lodge of the State of New York and organized on this occasion a Masonic ceremony entirely conventional. This ceremony was greatly criticized in subsequent years. Even today are under the base of the statue a portrait of Bartholdi, stamps, etc. Arrived at 29 feet, or 9 meters, workers sealed four huge beams linked together, forming a metal belt right inside the concrete. Then, at 55 feet (26 meters), four beams were set, but this time vertically. They were embedded in the concrete to the top of the pedestal, where they were joined together and fixed to metal beams forming the basis of the Gustave Eiffel structure. We can thus say that the skeleton of the Statue of Liberty is directly sealed in the walls of the base, attached themselves to heavy foundations itself the island. The set is perfectly fastened. Throughout the construction of the base, and even more when he began to rise in the air New Yorkers came in numbers approaching Bedloe's island. They were curious to see these big jobs, a huge project for the time, and the island was constantly surrounded by curious that never filled boats docked, of course. The year 1885 was that of the construction of the base of the statue of Liberty in New York. The foundation stone of the base, inaugurated twice in history. The engineer Stone faced a challenge: Reaching build the base as quickly as possible so that the site is on an island, 2 kms from the mainland. For that he had built a real little village in which the workers could live more or less independently without having to route them on site every day. The materials, themselves, had to be a constant supply, forcing the engineer to coordinate many trades. To manage all that Stone hired an energetic foreman, David H. King, who hired a large number of Italian maneuvers. They were housed directly on the island in a sort of little village created for the occasion, with many wooden huts and the few public elements necessary for life there. This rather thankless job, carried out in difficult conditions, was their tickets in the United States. 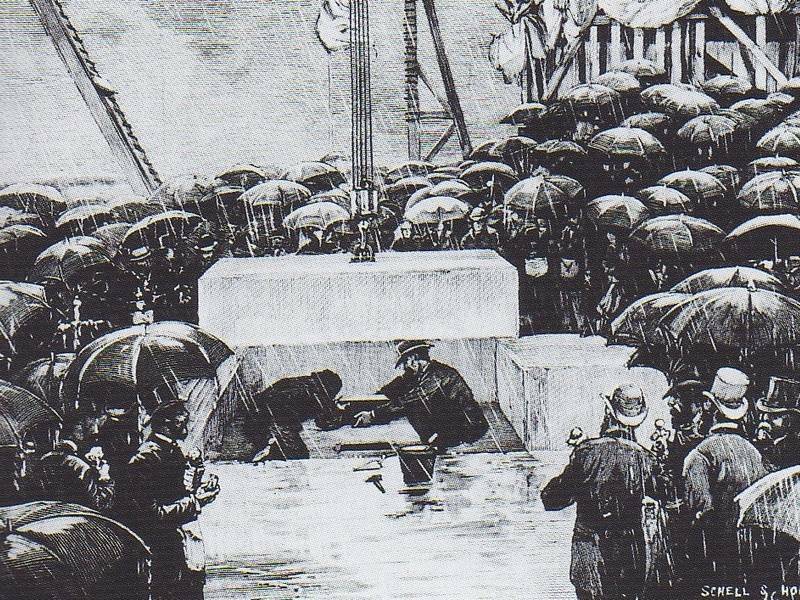 The base of the Statue of Liberty was made of concrete, a technique especially daring for its time it was recent. Until the buildings were built of brick or stone. The use of concrete has emerged for its strength, but especially for its implementation speed. This was particularly important since the fundraiser for the construction of the statue base was so slow that the statue, she was ready long before the first sod is given on Bedloe's Island! He had to catch up, hence the use of concrete. The foundations were sunk into a deep pit over 16 meters (53 feet) in the shape of a truncated pyramid whose base was nearly 28m and the top side, at ground level, 20m. They contain metal I-shaped beams which are embedded in the walls of the base and back to the top of the pedestal. It is these beams that came to be grafted later wrought iron structure of Gustave Eiffel. Thus, the set makes only one block, foundations atop the statue. Imagine the accuracy of the technical disclosure in order to coordinate the two structures ... Especially that engineers were 6000Kms away. Under the bark of the granite pedestal facade lies a thick heartof massive concrete and steel beams on which the statue of the iron skeleton is attached. The base itself was built as an extension of foundations, always concrete. This course is hollow, the walls are an average thickness of 2.50m as they are a little thicker at ground level at the top. Always at ground level, measuring 20m structure aside and reduced to arrive, on the feet of the statue, at just over 13m. The central part, accessible measure 8.25m wide. The total concrete architecture is the base of the Statue of Liberty built the largest building in the United States in the nineteenth century: 27,000 tons of concrete and stones, for a total of 12,200 cubic meters (13,300 cubic yards, to meet the English units). According to the time of words, the structure is so robust that they say that to overthrow the statue should reverse itself the island. 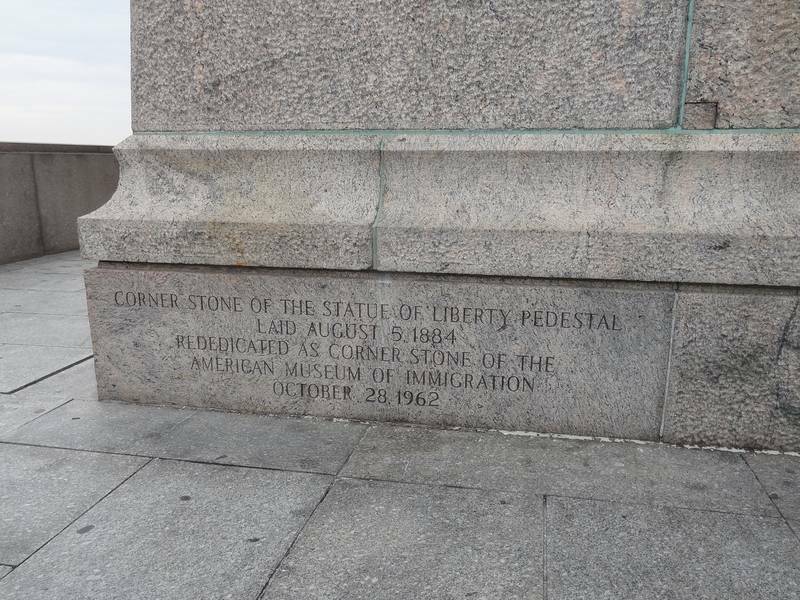 Once cast the pedestal was covered with granite stones from Connecticut to ensure her longevity. Thus exposed to the wind and the force of the spray, this set of concrete would be very vulnerable without effective protection. It has been said that these stones were of French origin. Some ensure that they come from the Plohernet career, Brittany, known for its solid granite. Others saw the extraction career in Ardèche, others in the Var, in the Jura, in the Ain, etc. There is a real fact that overrides the others: Why the engineers would seek hewn stone in France when they under the eyes, in the United States? The reality of facts is that these stones are from the Beattie career, on the island of Leetes (Connecticut). Transportation was provided by truck, from the quarry to the ocean, where a sailing vessel undertook transport to Bedloe's Island. 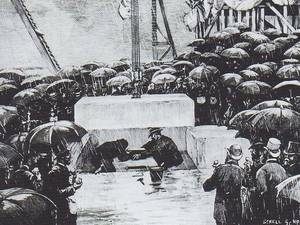 The construction ended April 22, 1886 with the laying of the last stone of the granite base. Laying the foundation stone of a rainy day. The statue is located in the center of the fort Bedloe, a fort built in the mid nineteenth century to protect the harbor of New York. It was decommissioned and left without useful function until 1871, when Auguste Bartholdi, the sculptor of the future Statue of Liberty, came to New York looking for a place for its implementation. This fort provided a perfect base for the pedestal of the statue, the latter nesting in the fort itself. Foundations made, masons began to raise Brittany stone on each other in layers. The base tapering, at its base, masons made wooden boxes they settled one above the other, a bit like a pyramid. The set was equipped with wooden stairs to masons, and cranes for the material. When talking about cranes, at the time, it was mainly an ingenious set of beams fixed V and provided at their ends with a pulley. Positioned in tilt with respect to the plumb walls, the forces required to pull the load is nullified in pairs, each set of beams being connected with another on the other side of the pedestal during assembly. The site used to a hundred men, though often they were less numerous in practice. The technical part is not limited to scientific calculations on the strengths and constraints, there is a critical factor to consider: The materials to be used. If it seems a bit surprising, the choice of stone to be used to build the pedestal of the Statue of Liberty was critical: Too soft stones and the statue might not stay too long on the spot! Morris Hunt then sought career stones having the ability to withstand the extreme conditions of the location chosen for the statue: Marine Air strongly iodized, recurring spray, high mechanical but random constraints (Due to storms). 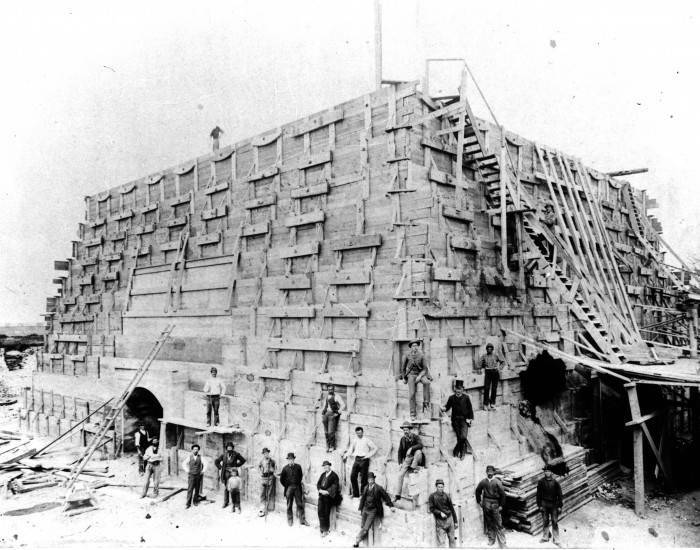 The choice fell on the Beattie career, a granite quarry in Connecticut booming, well known at the time, who had delivered granite blocks that allowed the construction of the pillars of the Brooklyn Bridge. The other materials are less noble: Very large amounts of concrete and metal reinforcement iron. The plane of the base is quite simple. At ground level is the Fort Wood, a defense fort of the New York Bay dating from the nineteenth century. The masonry of this fort was used as a base of the base, much like pre-foundations. The gap between the strong and the basement was filled in recently. 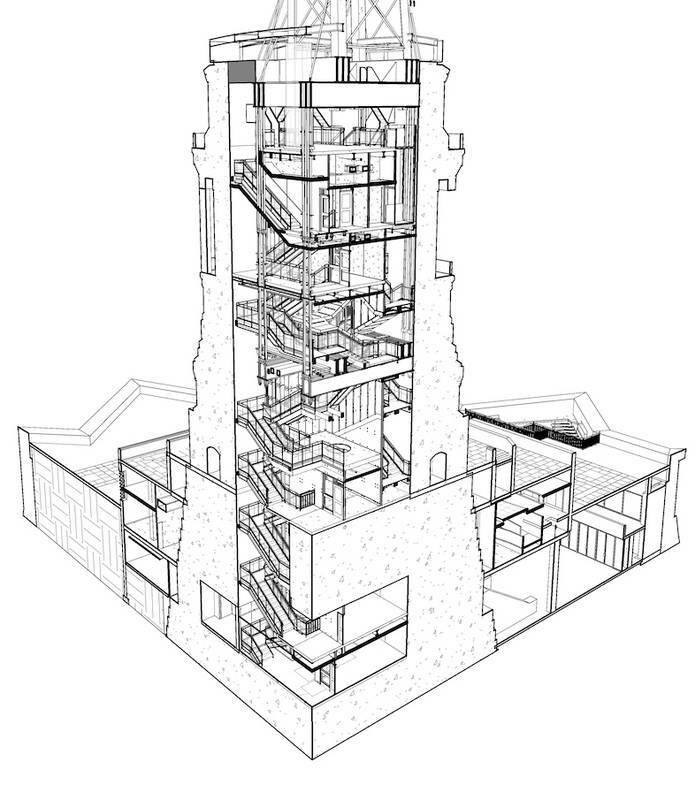 In this part there are already 3 levels plus the ground floor, this is where the museum is located. This 3rd level the visitor is at the height of the embankment, up the fortifications of Fort Wood. Then begins the base as seen. It consists internally of 7 other levels, corresponding to the 4th and 7th colonnade to the outside balcony, one that allows the visit of the foot of the statue. It is an observatory that most visitors take. To move from one level to another you have to take a wide staircase with many steps. 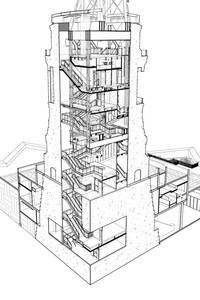 An elevator was installed during the 1986 work, those made to celebrate the 100th anniversary of the statue. The style is neo-classical, it's a style that is both surprising and normal. It is a surprising choice because at that time that style had already been abandoned in recent decades, neo-classicism has hardly passed the mid-nineteenth century. Still use this style in the late nineteenth century was at least curious. By cons, it is a natural choice when you look at the goal, namely magnify the statue itself. Indeed, the statue itself is neoclassical, so do not need a newer architectural element, it would have shocked. The question is: Why is the Statue of Liberty neoclassical? We may get asked because it was also designed following the end of that style. In fact, this is due to the will of Auguste Bartholdi who wanted a timeless work of art, using an ancient representation was not so incongruous as that. And Bartholdi took a female statue, serene posture is going better that such representation in neoclassical.